UPDATED: December 1, 2015, at 11:17 p.m. The masters of Harvard’s 12 undergraduate residential Houses have unanimously agreed to change their title, a term that some students criticize as associated with slavery and has come under scrutiny as debates about racism take hold of college campuses nationwide. College and House administrators will soon meet to select a new name to replace the “House master” title, according to Dean of the College Rakesh Khurana, who informed the Faculty of Arts and Sciences of the decision at its monthly meeting on Tuesday. Khurana, himself a master of Cabot House, said he will inform the College of the new title early next year. 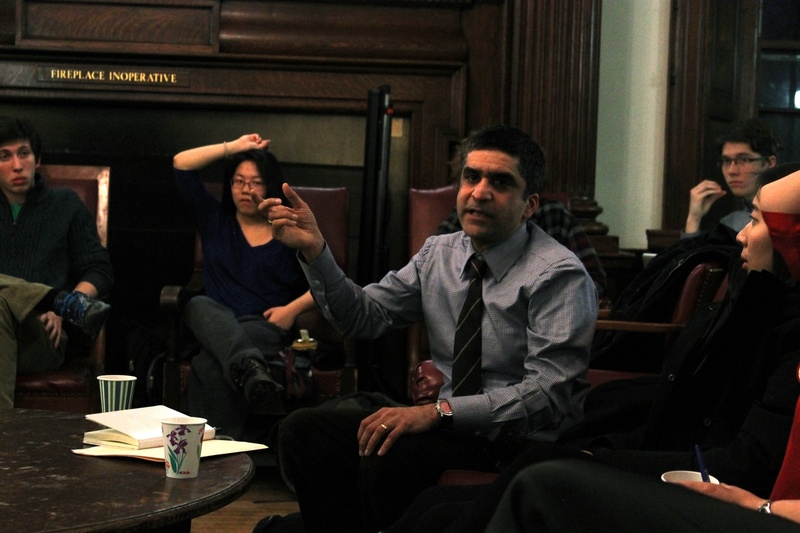 Dean of the College Rakesh Khurana, pictured in March. Administrators and House masters acknowledged Tuesday that the move to abandon the term was in part prompted by recent protests against racism on campuses across the country; some Harvard students have called for changing it, and the title of the equivalent position at Yale has drawn particularly sharp criticism. Still, the conversation around the change is an old one, administrators said. FAS Dean Michael D. Smith has approved the change and is “extremely supportive” of it, he said. University President Drew G. Faust also agrees with the move, according to College spokesperson Rachael Dane. Last week, Khurana said he personally feels uncomfortable with the title and that the College’s House masters, faculty members who oversee student residences, have been discussing changing it for some time. While acknowledging that the title “master” can take on various meanings—it is often used to mean “teacher”—he also argued that it is important to consider the “social meaning” of the phrase. “As someone who is responsible for and co-leads one of the Houses…. I have not felt comfortable personally with the title,” Khurana said in an interview. Ronald S. Sullivan, Jr., a master of Winthrop House, called the change “the product of many years” of discussion, but said House masters collectively made the decision to change it in the past few weeks. That decision came in response to student requests and recent College and national protests over issues of race on college campuses, he said. Conversations about changing the title were ongoing even before Smith assumed the FAS deanship in 2007, he said. “There’s no sense in putting this off any longer,” Smith said. Administrators now must choose a title to replace the term “master.” Princeton recently renamed its residential college master position to “head of the college”; at Harvard, two House masters—Christie A. McDonald and Michael D. Rosengarten, who oversee Mather House—also recently began asking students to call them by another title. McDonald and Rosengarten updated Mather’s website sometime before last week so that it listed them as “chief executive officers” of the House. That descriptor has since been removed from the site, but in an email, Rosengarten affirmed his discomfort with the “master” title. He has dropped the term from his position while waiting to form “a consensus for a new inclusive title,” he said. The impending change comes as Harvard and peer schools debate the use of names and terms historically associated with slavery and racism. Harvard Law School is reconsidering the use of its seal, which a group of students criticize because of its connection to a family that once owned slaves. At Yale, students have criticized the title of one student residence, named after John C. Calhoun, a former U.S. vice president, white supremacist, and vocal proponent of slavery. A group of Princeton students, meanwhile, is demanding that the university change the name of a student residence and its public policy school to remove association with former U.S. President Woodrow Wilson because of his record of racism. —Staff writers Karl M. Aspelund and Ivan B.K. Levingston contributed to the reporting of this story. —Crimson staff writer Meg P. Bernhard can be reached at meg.bernhard@thecrimson.com. Follow her on Twitter@meg_bernhard.